Addressing the collection, representation and exhibition of architecture and the built environment, this book explores current practices, historical precedents, theoretical issues and future possibilities arising from the meeting of a curatorial ‘subject’ and an architectural ‘object’. Striking a balance between theoretical investigations and case studies, the chapters cover a broad methodological as well as thematic range. Examining the influential role of architectural exhibitions, the contributors also look at curatorship as an emerging attitude towards the investigation and interpretation of the city. 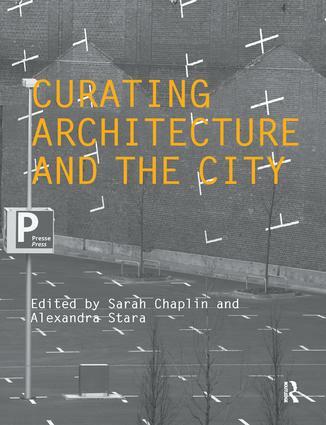 International in scope, this collection investigates curation, architecture and the city across the world, opening up new possibilities for exploring the urban fabric. Choosing (what) to learn from – Las Vegas, Los Angeles, London, Rome, Lagos . . .? From flash art to flash mob: how have new gallery spaces informed the nature of contemporary display? After branding: a lively downtown?